In 2011, Joe Harris began the second distinct phase of his international short-handed offshore sailing career by buying a new, third-generation Class 40 called the Akilaria RC-2, from the design office of Marc Lombard and built by MC-Tec. Although this boat is 10 feet shorter than his prior Open 50, with the evolution in yacht design, the boat is nearly as fast on most points of sail. Joe's plan in buying the new boat was to campaign the boat in a number of challenging offshore events that would lead up to an around the world solo non-stop attempt. 2011 brought the Normandy Channel Race and then the Fastnet. 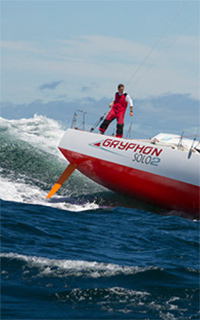 In 2012, Joe competed in the Atlantic Cup and then the Newport-Bermuda race. Then Joe again competed in the all-Class 40 Atlantic Cup, and then in the Bermuda 1-2. Having sailed the boat for three seasons now in both Europe and North America in the highly competitive arena of Class 40, Joe feels that he and the boat are ready to take it to the next level.